Full Service Storage - Connors Bros.
Full service storage is the opposite of self storage. With self storage, the customer drives their belongings to the storage unit, the customer loads the unit, locks the unit, and often has unlimited access to the unit. Full service storage is a system where the movers come to your house, inventory your shipment, load it onto our truck, and deliver it into one of our storage warehouses. When you are ready for your shipment to be returned we reverse the process and deliver your belongings back to you. 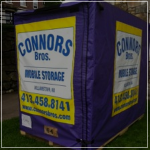 Connors Bros has been providing full service storage for over 50 years. Our movers are trained in house on how to properly inventory, load, unload, and palletize your belongings. Both of our warehouses are heated in the winter time.